The original fine art painting is magically glowing in a dark, because a special paint accumulates light and releases it at night. Textured acrylic medium, mirror paint, metallic and interference paints add shining effects when exposed to natural or artificial light. Painting changes its appearance when observed from different angles. All edges are painted as continuation of the painting. See image. No frame is required. It is ready to hang on your wall right away. Painting has a heavy-duty protective topcoat that allows wet cleaning with a soft moist cloth. It is resistant to water, abrasion, impact, stains, chemicals and UV ray. Are you looking for a cool original Art for yourself or somebody you love? Overwhelmed from a lot of choices? While you are busy contemplating and focusing on visual movement, energy of the painting will unlock your energy within for more Good Luck, Happiness and Love. Artist uses lines, textural planes and symbols to show a dynamic multidimensional structure with intense light bursting from the center. Seven symbolic “holes” (oval, triangular, circular, heart and star shaped) represent portals for energy flow from one dimension to another. 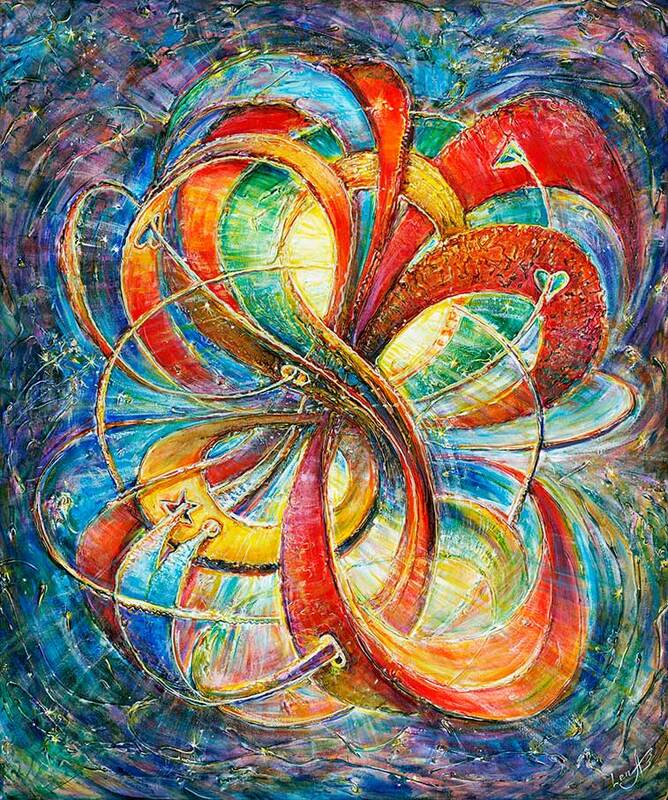 There are several continuous line loops circulating through the 7 symbolic openings (lucky seven on this painting). You can see them better in darkness, because they are painted with a special paint accumulating light and glowing in a dark. For better glowing effect expose the painting to bright light at least for 5 minutes before looking at it in a dark room. The painting contains hidden image of an OWL – symbol of the hidden Divine Light within. Location of the Owl is indicated on the back of canvas. The painting is the awesome gift for Housewarmings, Weddings, Engagements, Valentine's Day, Birthdays, Holiday, Christmas, Graduation, any romantic occasion or a magnificent and exciting treat for yourself. It brings light, happiness and love to your life.